New regulations are expected to cost California citrus growers an average of $701 per acre per year, or $203 million annually statewide, according to a new study commissioned by the Citrus Research Board (CRB). “Babcock has presented a well-researched economic report that shows how new regulations will increasingly impact California’s citrus industry,” said CRB President Gary Schulz. The 20-page report includes a breakdown of increases in labor costs, including California’s minimum hourly wage increases, which are scheduled to rise in annual increments to $15 over the next four years. The report also covers the projected cost increases of recent state legislation dealing with paid sick leave, payment rates for rest and recovery periods, overtime and workers compensation. Babcock, a Fellow of the Agricultural and Applied Economics Association, has won numerous awards for his applied policy research. He received a Ph.D. in Agricultural and Resource Economics from UC Berkeley, and Master’s and Bachelor’s degrees from UC Davis. 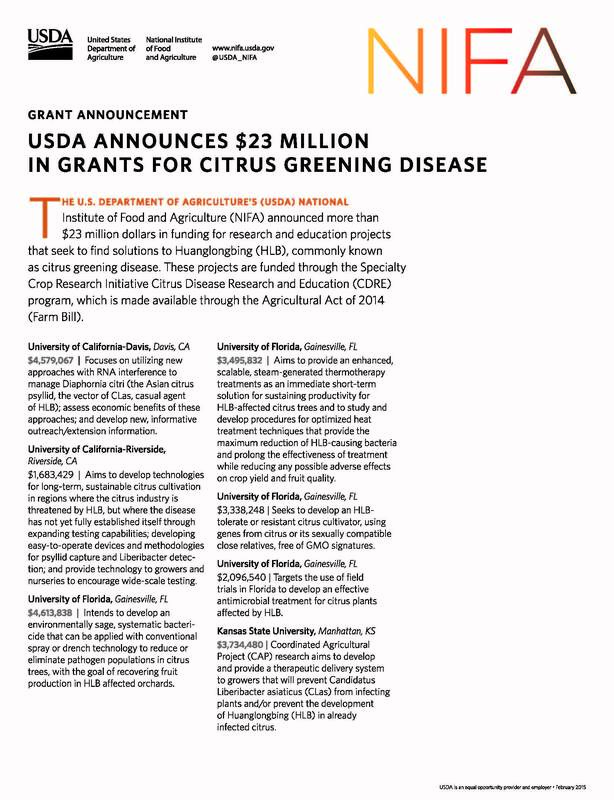 The CRB administers the California Citrus Research Program, the grower-funded and grower-directed program established in 1968 under the California Marketing Act, as the mechanism enabling the state’s citrus producers to sponsor and support needed research. The full report on the Impact of Regulations on Production Costs and Competitiveness of the California Citrus Industry, as well as more information about the Citrus Research Board, may be read at www.citrusresearch.org. Psyllids have a preference for borders. These nets could have yellow sticky strips of material with an insecticide on it, so there would be an attract and kill process. Other research is looking at netted structures that will completely enclose the citrus trees. “The mother trees and increased trees have to be grown under the screen, but the field trees do not necessarily have to be,” she said. Cold temperatures in the winter to protect the citrus from the psyllid. “The cold temperatures hardened off the tissue, which makes it hard for the psyllid to find any place to lay eggs, and they probably cost some mortality to the psyllid,” Grafton-Cardwell explained. Most outbreaks are in Southern California. Los Angeles, Orange County, and a few trees in Riverside. “Prevention is working and there are fewer outbreaks in the Central Valley,” Grafton-Cardwell said. Dr. Mark Hoddle and Dr. Kelsey Schall (both from UC Riverside) have been monitoring backyard situations. They are researching the release of beneficials such Tamarixia and other generalist predators like Syrphid flies. “They have been reducing psyllids by about 70 percent in the backyards, and that’s really good news,” Grafton-Cardwell said. 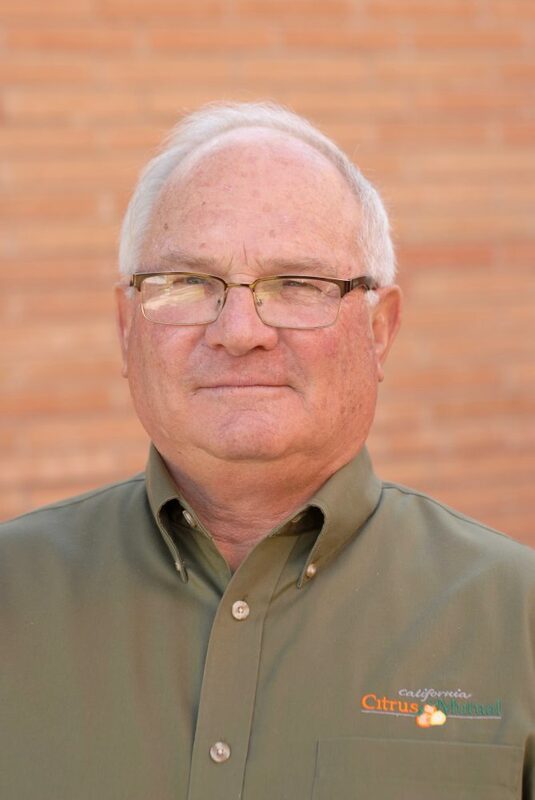 Despite Tulare Mayor Carlton Jones posting a series of anti-ag comments on Facebook, causing a stir in the local community, agriculture provides a huge economic stimulus to his community. In fact, without agriculture in Tulare, the city would most likely be in economic ruin. Citrus is one crop that is grown in the county. And the total economic impact of the iconic California citrus industry is $7.117 billion according to a new study commissioned by the Citrus Research Board (CRB). “In updating our economic analysis, we selected a well-known expert, Bruce Babcock, Ph.D., a professor in the School of Public Policy at the University of California, Riverside, to conduct the research. His findings quantified the significant impact of citrus on California’s economic well-being,” CRB President Gary Schulz said. According to Babcock, the California citrus industry added $1.695 billion to the state’s Gross Domestic Product (GDP) in 2016. The study revealed that 79 percent of California’s citrus was packed for the fresh market and 21 percent was processed in 2016-17, which is economically significant because fresh market fruit has a higher value than processed fruit. Babcock is a Fellow of the Agricultural and Applied Economics Association and has won numerous awards for his applied policy research. The economist received his Ph.D. in Agricultural and Resource Economics from the University of California, Berkeley, and his Masters and Bachelors degrees from the University of California, Davis. Announced TODAY, the Asian citrus psyllid or ACP Quarantine has expanded to include an additional portion of Santa Clara County following the detection of multiple psyllids in and around the City of San Jose. The quarantine expansion adds 61 square miles to the north, bringing the total quarantine area to 160 square miles. A map is available online at: www.cdfa.ca.gov/plant/go/acp-quarantine. Residents with backyard citrus trees in the quarantine area are asked not to transport or send citrus fruit or leaves, potted citrus trees, or curry leaves from the quarantine area. In addition to quarantines in portions of Santa Clara, Fresno, Kern, San Joaquin, and San Luis Obispo counties, ACP entire-county quarantines remain in place in Imperial, Los Angeles, Orange, Riverside, San Bernardino, San Diego, Santa Barbara, Tulare and Ventura counties. The ACP is an invasive species of grave concern because it can carry the disease huanglongbing (HLB), also known as citrus greening. All citrus and closely related species, such as curry trees, are susceptible hosts for both the insect and the disease. There is no cure once a tree becomes infected, the diseased tree will decline in health and produce bitter, misshaped fruit until it dies. HLB has been detected just once in California – in 2012 on a single residential property in Hacienda Heights, Los Angeles County. This plant disease does not affect human health. Residents in the area who think they may have seen ACP or symptoms of HLB on their citrus trees are urged to call CDFA’s Pest Hotline at 1-800-491-1899. For more information on the ACP and HLB, please visit: www.cdfa.ca.gov/go/acp. The Tulare County Agricultural Commissioner’s offices announed TODAY that two additional Asian citrus psyllids (ACP) have been detected on one trap south of the city of Exeter. The latest interceptions were confirmed by the California Department of Food and Agriculture (CDFA). Maps and current information are available on the Tulare County Agricultural Commissioner’s website. CDFA has already begun to saturate the affected areas with detection traps in order to determine the extent of any infestation.The United States Department of Agriculture’s Animal and Plant Health Inspection Service (USDA-APHIS) and CDFA will work collaboratively to determine what steps are taken next. The ACP is an invasive species of grave concern because it can carry the disease huanglongbing (HLB), also known as citrus greening. All citrus and closely related species are susceptible hosts for both the insect and the disease. There is no cure once a tree becomes infected. The diseased tree will decline in health,producing bitter, misshaped fruit untilitdies. To date, HLB has been detected on just one residential property in the Hacienda Heights neighborhood of Los Angeles. Tulare County Ag Commissioner Marilyn Kinoshita said that her staff will continue to support the efforts of our $750 million citrus industry, as well as our residential citrus owners. “I want to emphasize that citrus fruit is safe to eat and the disease is not harmful to human health,” said Kinoshita. Residents in the area who think they may have seen ACPs are urged to call CDFA’s Pest Hotline at 1-800-491-1899 or the Tulare County Agricultural Commissioner. Media inquiries related to technical questions about Asian citrus psyllid and Huanglongbing (HLB) disease are encouraged to contact Katie Rowland, Account Coordinator for Nuffer, Smith, Tucker Inc. at (661) 817-3638. The best way to fight HLB is to suppress the spread of ACPs which can carry it. So, California Citrus Research Board hired Nuffer, Smith, Tucker, (NST) a public relations firm, to raise awareness of ACPs and HLB, especially among the many California homeowners with backyard citrus trees who may unknowingly be harboring the pest, and to encourage the public to take necessary steps to save California citrus. NST’s comprehensive outreach plan included the formation of a dedicated website; outreach to stakeholder groups; public service announcement development; radio news release distribution; traffic spot placement; elected official education; participation in community events; social media outreach; and heavy media relations, including statewide media tours in English and Spanish. Outreach results include over 100 billion impressions in 2012 alone, briefings with 365 local government and elected officials in 110 cities, and CDFA reported an increase in phone calls to the ACP hotline. For further information, click on CitrusInsider.org and CaliforniaCitrusThreat.org.